It’s adventure time for gnomes as they travel and gather items along the forest trail. Typically cheerful and friendly, the little gnomes let greed and aggression get the best of them as they get into brawls, play tricks, and set traps to be able to grab up and trade for the most gems by the end of the game. It’s a gnome-tastic adventure!! Oh Gnome You Don’t! Board Game has 104 beautifully illustrated draw pile cards. There are green cards which are the items that the gnomes can play (table) on their turn. Items are found in the forest (Deer antler, baby field mouse, firewood, etc) or harvested (berries, nuts, mushrooms,honey, etc) or items that gnomes make (Woven basket, whittled flute, etc). Purple cards are actions or attacks that gnomes can play on their turn to affect themselves or another gnome. Red cards are attacks, defense, or interrupts that can be played on other gnomes’ turns. Each gnome gets two green titled cards to start the game. Turns consist of Roll Move Play a card Draw a card. No card is played or drawn when visiting a business. If playing the advanced rules with Brawling (gamers: this is a must!) then the turns include the brawl” Roll, Move, Brawl, Play, Draw. No brawling in a business. It is bad manners. 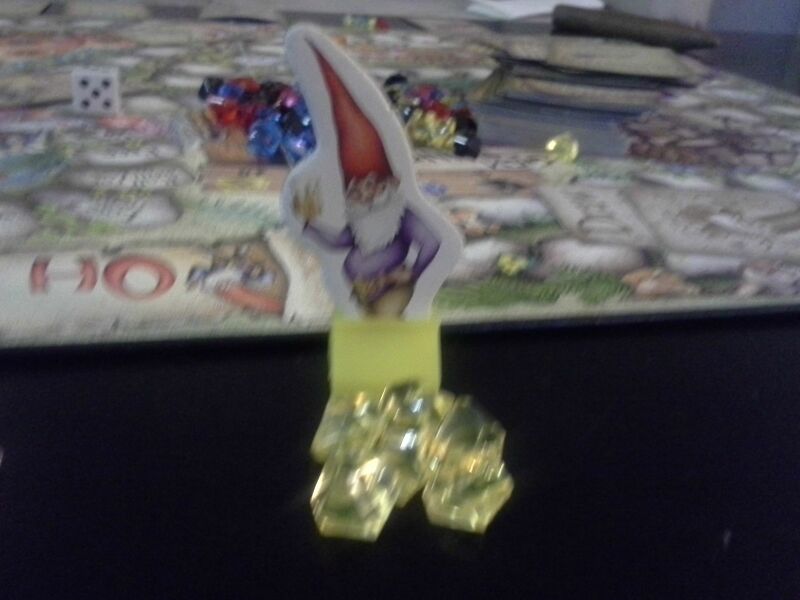 Oh Gnome You Don’t Board Game contains 100 sparkly gems. The gnome richest in gems wins the game. The gems are stored on the Gem Mine on the board. When gnomes sell items at a business, go mining, or brawl with another gnome they collect gems from the gem mine. Gold=10 Red=5 Blue=3 Black=1. The contents of the game also includes: 18″x24″ folding board 104 color, beautifully illustrated draw pile cards 50 Brawl Cards 1 die 4 page shiny, illustrated,color instruction sheet. 5 Stand up Gnome moving pieces The box for the game is the same size as Redneck Life and Trailer Park Wars! It weighs a tad under 2 lbs. For 2-5 fun-loving players ages 13+. Game play is typically 90 minutes. Oh Gnome You Don't has been the go-to game night fave for a few months now. Tonight we modified the brawl rule. We randomized it, so you shuffle your brawl deck and draw face down. Literally a game changer. Everything else stays the same. There is a card that allows you to return your highest discarded brawl card to the deck - so shuffling is then required. It's a start to finish board game. Who ever has the most gems at the end wins. You sell your played items at specific stores for more money, or any store for less money. The rules are great - Role, Move, Play, Draw. You have 3 types of cards: Green - table these items during your play phase. Items in your hand and not on the table can't be sold. Purple - also played on your turn - stuff to either help you, or screw over another gnome. Red - These either block attacks or start static. The game art is why I bought it. It plays so simple my son, age 7, can play and win. The gnome pieces are sturdy enough. it comes with a whole bunch of gems valued in the game: 1, 3, 5, 10. If I have my own rating system for games - under the original rules this game was a 3/5. It was fun but the brawl cards just weren't used. Under the modified rules, I give it a full 5/5. 6 players is crucial for our group as there are 5 of us and sometimes a WAG wants to play or a buddy comes to town. So everyone gets to play, the mechanics are wicked simple, the art is great, and the replay factor - considering sorting out the green items for setup and getting reset - 2 minutes. Tonight was great, a young man from Russia joined us, it was the debut of the modified mechanics and the game really moved. Did I mention I won by a landslide?